Easily grow more larger tomatoes! 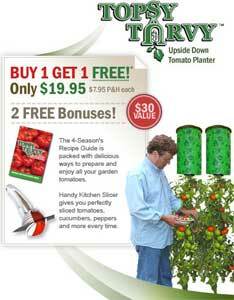 The Topsy Turvy™ Tomato Planter works in a simple yet ingenious way. As the sun warms the plant like a greenhouse, the root system explodes and thrives inside the planter. Because the Topsy Turvy™ is upside down, water and nutrients pour directly from the root to the fruit, giving you up to 30 pounds of deliciously ripe tomatoes per plant! Enjoy delicious tomatoes all year round! Use your Topsy Turvy™ to grow deliciously ripe tomatoes for homemade sauces, sandwiches, salads and more without harmful pesticides or backbreaking work.